We encourage you to read the first hand accounts from past volunteers below... or if you'd rather watch/listen to a video interview, please click one of the green buttons. Thank you for your interest in our orphaned children and the possibility of traveling to Swaziland to meet them! My trip was one of the best choices I have made in my college career thus far. Taking a service trip like the one Give Hope Fight Poverty offers to college students is an opportunity that has the ability to educate outside of the classroom and change students perspectives. Taking this trip allows students to see that there is a real need for their future professions all over the world no matter what the field of study. Not only is this trip educational and eye-opening, but it is also a chance to impact someone else’s life in a positive way through volunteer work. In only 10 days, I was able to learn about the Swazi culture, experience the impact that students like myself can make, and grow as an individual. I would highly recommend this trip to any student dedicated to positively impacting the lives of those who are not as fortunate! It’s difficult for me to put into words how Give Hope, Fight Poverty has changed my life. When I signed up for this trip, I thought of the impact I could possibly make, or the ways I could help while in Swaziland. After the experience, I was more blown away by the ways this trip impacted MY life, and allowed me to see the world in a totally different light. It is so heartwarming to see the children's welcoming smiles, their gratitude, and perseverance for life. It’s truly amazing to see and experience firsthand the change that GHFP is bringing to the communities and orphans in Swaziland, I am so thankful this organization exists! I went to Swaziland with the thought that I would be giving of myself to a cause. I was able to aid in building facilities, deliver emergency food packages and to my enjoyment spend time with the children. I went to give, but came away having gained more than I could ever imagine. While Swaziland is amazing, the trip was all about the people we met and worked with. We were able to connect so much so that sometimes I would forget there was a language barrier. They have great need because they live in poverty. Despite their need, they have joy. It was truly a privilege to go there and get to know them. I genuinely missed Swaziland when I left and hope to return soon. Give Hope, Fight Poverty is a wonderful organization to travel with that makes effective use of the service we provide as well as the financial support from their donors. My participation with GHFP has truly been a blessing. I have had the opportunity to travel to Swaziland twice. Words can't do this amazing experience justice. It's very humbling to be a part of something so honest and to see the difference we can make in these kids lives. Both of these trips helped me put things back in perspective and opened my heart to something I hadn't experienced before. The joy that I felt spending time at the schools or with the kiddos in their homes was amazing. It's very eye-opening to see that kind of poverty up close but even more so to see the difference it makes to when someone gives them hope. This organization has literally changed the lives of these kids and the lives of every volunteer involved in the process. If you haven't been yet, you don't know what you're missing. I assure you, this experience will last a lifetime! When I first learned of the possibility to travel to Swaziland, I was filled with joy and excitement. While there, I was able to see the reality of poverty, and how we can all easily make a difference. I was amazed by how generous the Swazi people were, and by their undying perseverance for life. Although we were only a small group of people, it was evident how much hope we brought to everyone we met. Because I have had this experience, I feel forever changed by their kindness, and I will continue to advocate for GHFP to help the people who deserve the most. As a student in the medical field, my greatest passion is helping others and receiving that sense of joy when I look at their happy faces. I can honestly say that going to Swaziland was the best decision of my entire life. These children are so full of happiness and have a thirst for knowledge. They are brought up with nothing and yet contain so much kindness and selflessness. One boy, Samkelo, is an absolute inspiration to me. As a teenager he dropped out of school to take care of his younger siblings and is completely mature beyond his years. I consider him a hero. In those couple of weeks I spent in Swaziland I thought I was going to help these kids and help change their lives through this organization. Coming back I realized that it was the other way around; they completely changed my life. Because of them I know I am a better person and they taught me that life is all about the people you’re surrounded by and the happiness you share. I am so incredibly grateful to have been a part of this organization and this experience. I hope to return to Swaziland very soon to see these kids I miss and love so much! I traveled to Swaziland excited to learn about a new culture and do what I love, which is working with children. What I got was an incredible experience that changed my life. Working with under-served youth in my everyday life is extremely rewarding but nothing can compare to the experience and life lessons I learned in Swaziland. The children that I was so fortunate to meet had so many challenges and struggles to overcome every day, things that I couldn’t even dream about overcoming if I was their age, but the desire and attitude they have about life is truly unbelievable. Listening to them talk about their aspirations and goals they have for themselves was an unbelievable experience, it made me take a look at myself in a way that I never have before. I have a greater appreciation for the life I am able to lead because of Swaziland and now have an overwhelming desire to help out Give Hope Fight Poverty in any way possible. I find myself thinking about Swaziland everyday and I know it will be a part of me forever. 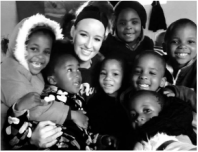 "Swaziland has impacted my life in a tremendous way. I am more aware of what blessings I have and the opportunities that I am fortunate to be a part of. The people of Swaziland are inspiring to me because of what they have to go through on a daily basis. If there is anything that I have learned from the trip is that you should never give up on faith and to always have hope." I traveled to Swaziland as a public health student. This trip provided me the opportunity to experience another culture and further develop my interest in global health issues. The time spent with Swazi orphans was an incredible experience I will never forget. Their dreams and zest for life, despite their circumstances, were truly amazing. After spending time with families in the village, we were also able to visit orphanages and hospitals. The hospital visit solidified my desire to pursue a second degree in nursing to allow me to pursue my passion in reaching out to vulnerable families worldwide. I look forward to upcoming trips in the near future! "Don't ask what the world needs. Ask what makes you come alive, and go do it. Because what the world needs is people who have come alive." May2017 Video Interview with Ashley Burton!